The sisters are two of the hundreds of Ethiopian Israelis who, filled with frustration, came to Tel Aviv two weeks ago in May 2015, to demonstrate against the racism they suffer from. Their anger was set off by a video that went viral, showing a police officer brutally beating a uniformed Israel Defense Forces soldier of Ethiopian descent. Three days before the Tel Aviv protest, the first demonstration of mostly young Ethiopian Israelis took place in Jerusalem. Although this gathering ended considerably peaceful, the protest in Tel Aviv deteriorated into violence on the part of both demonstrators and the police. Seven protesters and 56 police officers got injured, and 43 people were arrested. According to the demonstrators, the police made use of ‘unreasonable force’ to disperse them, including sending mounted officers into the crowd and hurling stun grenades. The police, on the other hand, said they restrained their interventions as long as possible. Nonetheless, it was about time the voices of the Ethiopian Israelis were heard, says Rachel. “Our parents came to Israel three decades ago and were always being discriminated against, but they didn’t speak up. This is a new generation.” After Tel Aviv, protests were held in Ashkelon and Beersheba. In fact, the discrimination of Ethiopians goes back to the very beginning of their immigration to Israel. In 1950, Israel implemented the ‘law of return’: all Jews worldwide are allowed to settle themselves in Israel. However, Ethiopian Jews were initially not considered to be ‘real Jews’. In the late seventies, the Sephardi Chief Rabbi at the time, Ovadia Yosef, settled this dispute in favor of the Ethiopians. In 1984 and 1985, about eight thousand of them were flown in from Sudan, where they resided in refugee camps. When they finally arrived in Israel, their physical integrity was massively harmed: men were forced to undergo mass circumcision, and women were said to be subjected to forced sterilization. Today, the 135,000 Ethiopian Israelis still suffer from the highest poverty rate of any Jewish segment of the population. According to the Ethiopian National Project, “49 percent of Ethiopian families in Israel live in poverty, and households earn only 63 cents on the dollar”. According to Rachel, who is a resident of the Tel Aviv suburb of Ramat Gan, an Ethiopian gets arrested more easily for the same offense than a white Jewish Israeli. In this sense, Ethiopians can be compared to the Arabs in Israel, she says. After all, Arabs tend to get punished more severely for the same offense than their Jewish countrymen. Avivit believes Israeli society is “sick”. “We are not the only ones being discriminated against. Russians and Mizrachim, for example, are excluded as well.” ‘Mizrachim’ is a collective term for Jews who originally lived in the Arab world. Most of them came to Israel in the years after 1948, when the state of Israel was established. In response to the creation of a Jewish state in their middle, the Arab countries began to persecute and expel their Jewish communities. During a press conference that was held in Tel Aviv last Sunday, a group of Ethiopian Israeli activists laid out certain demands towards the Israeli authorities. First of all, they want the police officer who beat up the soldier to go on trial. Moreover, they want all the charges against the protesters who were arrested during the violent protests in Tel Aviv to be withdrawn. 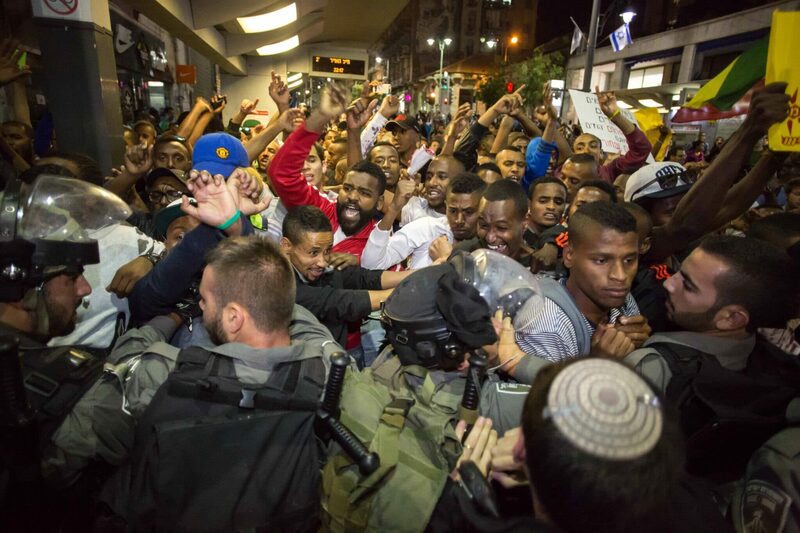 If not, the Ethiopian Israelis will continue their protests, the activists stated. In the long run, they also want to see improvements in education, housing and welfare for the Ethiopian Israeli community. Politicians, meanwhile, all of a sudden seem to care a lot about the fate of the Ethiopian Israelis. Last week, Prime Minister Netanyahu met with leaders of the community, and with the abused soldier, Damas Pakada. At the Tel Aviv demonstration, Naftali Bennett, the leader of the ultra-right political party The Jewish Home, showed up to talk to the protesters. The sisters Avivit and Rachel are not really interested in politics. Two months ago 17 March, when elections for the Knesset were held, they didn’t even vote. They have no hope that Netanyahu, who formed a very right-wing government last week in May, will be able to do something for them.